Documentary following a group of teenage students - Binky, Austin, Syd, Roisin, Angel and Alijah - learning the craft of hairdressing at the Hair Academy. Following the highs and lows of teenage students as they embark on a career in hairdressing at Scotland's biggest hair academy. They experience the glitz and glamour, but will they all make it through? 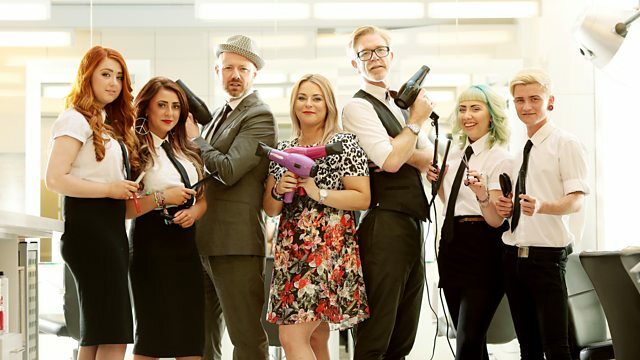 The Hair Academy is introduced with an overview from owners Alan and Linda Stewart. We meet the characters including strict head teacher Leigh. The Rainbow Room Style Team prepare for their pop-up salon at T in the Park and announce which two students have been picked to help out at the festival. Students Binky, Austin, Syd, Roisin, Angel and Alijah explain why some have had to pick new salon names. Student Sophie helps her mum through her serious illness and loss of hair. Student Angel has a hairdressing test and the salons come together for the Rainbow Room charity single auditions. Some unexpected musical talents are unearthed along with some less spectacular musical auditions! We say goodbye to Roisin, the first student to drop out. Backstage at T in the Park at the pop-up mobile hairdressing salon brings this episode to a glamorous conclusion. Who'll get the golden tickets to T in the Park?